Finally, The Greatest Monthly Magnetic Refrigerator Calendar Has Just Been Released! Wait No More! Are you leading a busy life with way too many meetings and appointments to remember? Do you want to organised your family in a smart yet efficient way? Are you sick and tired of forgetting little things that you have to do on a daily basis? If the answer to any of those questions is yes, then you should keep on reading because we have the ultimate fridge dry erase magnet board and organizer for you. Made from high quality and flexible materials, the Eco-Planner magnetic fridge calendar will compliment any given area around the house and organize your life from this day on. Create shopping lists for your hubby, write down the soccer or ballet practice, cute love notes, dates to remember and events never to miss out ever again. It can be used as a chores planner, to do list, meal food planner, upcoming birthday reminder and a message carrier for your beloved ones. Make your notes or drawings and simply erase them with the magnetic eraser. The erase board will last for the many grocery shopping lists to come. Still Not Convinced That This Magnetic Calendar Organizer Is What You Are Looking For? ✔ Flexible and easy to use monthly magnetic fridge board. ✔ Promote organization, boost memory and never miss an important event again. ✔ Suitable for kids, families, students, offices, restaurants and more. ✔ Attractive and stylish monthly magnetic planner kit. What are you waiting for? Get your black magnetic calendar kit today and one as a gift to a beloved family member. ✔ HASSLE FREE MONTHLY MAGNETIC PLANNER: If you are looking for ways to put your life in order and plan ahead nice and easy, then we got you covered. Our black magnetic monthly planner is here to stay and ameliorate your life to the fullest from now on. Perfect for kids, parents, students, college studies, workplace and more! ✔ SUCH A MULTIPURPOSE DRY ERASE ORGANIZER BOARD: Easy to clean. Clean with Dry or Wet wipe new waterproof design!This dry erase board can be used in many cases either at home, the office or at school. It is ideal for basketball practice schedule, office meetings, food meal planning, doctor appointments, wedding receptions, baby showers reminders and other important events that come in mind. 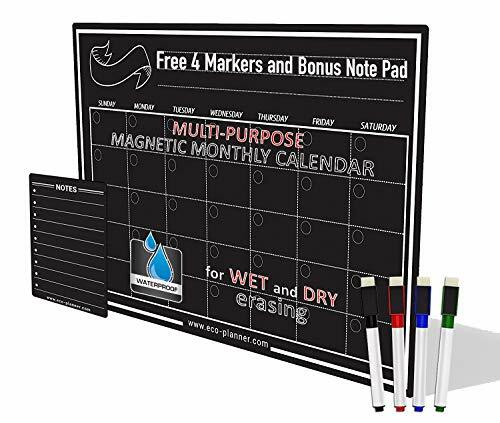 ✔ POWERFUL MAGNETIC DRY ERASE MONTHLY SCHEDULE: Our monthly magnetic refrigerator planner is made from high quality materials, so as to last for the many years and to do lists have yet to come. The powerful magnet will stay right where it should be without sliding or scratching your fridge, desk or walls. ✔ BUY NOW THE GREATEST REFRIGERATOR MAGNETIC CALENDAR RISK FREE: Since your satisfaction is our top priority, this magnetic fridge calendar is backed by our unconditional 90-day money back guarantee policy, just in case you don't simply love it. No questions asked. Makes a wonderful housewarming gift to a dear friend. If you have any questions about this product by Eco Planner, contact us by completing and submitting the form below. If you are looking for a specif part number, please include it with your message. Family Size Multi Use Magnetic Dry Erase Board Chore Responsibility Chart Menu Planner To Do Fluorescent Calendar 12"x17"